Family ticket includes 2 Adults & 3 Children or Students under 21years. For 3D movies $2 surcharge included in ticket price. A "Child" includes children from 3years and until the end of Primary school. Identification is required for students, seniors and concession tickets. Please note only the following cards are accepted: Secondary High School student card, Tertiary card to 21 years of age, Seniors card, Blue Pension card and Companion card. *Please Note a Booking fee of $1.00 per ticket will be charged for All "Online" ticket purchases. * No Bargain Tuesday Prices on Public Holidays. Once a week you have an opportunity to see your favourite movies at low prices. Select a movie or live performance session and follow the prompts to purchase your tickets. It is against the law to allow anyone under the age of 15 into a MA15+ without a parent or legal guardian (Older Siblings and Friends' Parents are not legal guardians). If you are 15 or over, you won't be admitted into a movie with identification. It is against the law to allow anyone under the age of 18 into a R18+ Movie under any circumstances. Proof of Age Must be produced on request. If you are under 25 years old, please make sure you bring identification with you, just in case, because you will most likely be asked to prove your age. - If your child is over 15, and are attending a movie without you, please make sure they take their identification with them (License, Student Card, Photo I.D. Card, even a birth certificate, etc). This saves you a lot of hassle if they are refused entry and have to contact you to get proof. - If you are attending a movie with your child and their friend/s, make sure your child's friend/s have their I.D. because they won't be admitted entry without it because you aren't their legal guardian. - If you are a guardian of your younger sibling/s and/or any other children, it is wise to bring proof of this (medicare card, etc). We hope you understand that this is the law and there are heavy fines for our staff and venue as a result if it is broken. Also, please refrain from being hostile towards our staff, especially our juniors, because they are only doing their jobs. If you have any serious complaints, ask to speak to the supervisor or manager. If you're still not satisfied, feel free to visit www.classification.gov.au or call the Classification Operations Branch on (02) 9289 7100. Movie tickets will only be refunded before the ticket session has started. A refund may also be given under some circumstances within the first 15minutes of the feature by speaking with the "Manager" on duty. We are unable to give refunds on "Live Performance" tickets as we are providing a venue and ticketing service for a Hirer. A Refund will only be given if a show is cancelled. A refund may be given in cases of extreme circumstance with permission from the hirer. We do not refund due to change of mind or inability to attend. Ideal presents for all your family and friends. They can be redeemed any time for any session. Prices are based on 2D regular sessions or 3D sessions. An attractive gift envelope is supplied with the tickets. On a purchase of 5 tickets only pay $65.00. You save up to $20.00. 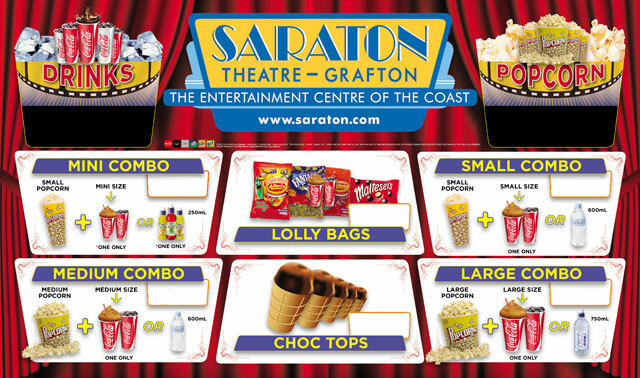 A $20 Gift Voucher is also available which includes a single movie ticket and a Small Popcorn & Drink Combo. Saraton Theatre is excited to present the immersive experience that 3D offers with new state-of-the-art 3D technology. To watch 3D movies at Saraton Theatre you are required to wear special battery-operated active 3D glasses supplied by Saraton. A $2 fee applies to all glasses. The glasses must be returned to the Saraton collecting station in the bin located in the foyer, after use. They are not suitable for TV or any other use and must not be removed from the Saraton premises. 3D glasses taken from the Saraton premises will be classed as stolen Saraton property. Saraton reserves the right to change prices, terms and conditions at any time. We have extensive Candy Bar offerings with assorted drinks, popcorn, choc tops and sweets.